Wuji Gong was founded by Zhang San-Feng, the originator of Taijiquan, (Tai Chi) in the Ming Dynasty, some 600 years ago. It has been passed down for generations to Master Zhu Hui. It is a Taoist internal style of qigong. The core idea behind the practice is derived from Taoist cosmology. First was the utmost point of nothingness (wuji), then came the great ultimate (taji). The form takes the practitioner through the four directions: east, south, west and north, while constantly maintaining the still point in the center. This exercise combines movement, breathing and visualization to produce a powerful qi (energy) field that the practitioner can then carry forth into the rest of their life. It stimulates the flow of qi (vital force) for health and longevity. It also boosts immune functioning, promotes circulation and lymphatic flow. This powerful and elegant qigong form will be a valuable tool for self cultivation and self discovery for the rest of one’s life! By working with the primal energies of the five directions (including the center) the practitioner is performing an energetic ritual that works on many different levels. 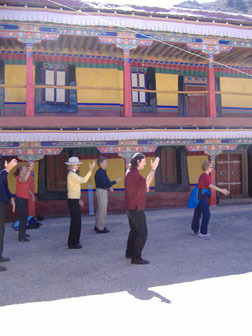 This class is open to beginners as well as experienced students of qigong. This class will also include basic qigong theory, Taoist cosmology, and healing meditation. Classes are usually held as a weekend seminar. Complete handouts are provided. “Standing with my feet rooted to the earth and my head in heaven, I am relaxed and natural. I am in harmony with the universe. I am a channel between heaven and earth”. So begins my practice of Chinese Essence Qigong, an extremely simple yet sublimely powerful form. As I slowly relax—my muscles, my nervous system, my thought forms, my breath – I feel myself enter deeply into the qi state, a state of complete peacefulness and harmony. It is a state that I will go in and out of over the next twenty minutes of my practice, as I practice letting go of thoughts, conceptions and emotions and instead flow gracefully and deeply into the qi state. Slowly my palms come up in front of me, holding an invisible yet very real qi ball. They come together over my head, at my bai hui point and down the front of my body then up the back – smoothing, combing and energizing the qi channels there. Then they come out to two sides, like the wings of a great bird, come together again over bai hui and then descend down the back and up the front of my body – again smoothing, combing and energizing. Then up at a forty-five-degree angle and along the outside of my body and up the inside of my legs. Now I stand within the qi field that I have created and massage my five major organs, hands moving lightly over my body – opening, harmonizing, healing the liver, heart, spleen, lungs and kidneys. Then, holding six points on my body I beam white light into them – opening them, relaxing them, balancing the three centers of the body. Later, while I stand in meditation posture and feel the waves of energy flowing over and through me I give thanks for this simple yet vital practice. The “formless form” as my teacher, Chen Fu Yin, calls it. It is in letting go of the mind, letting go of the expectations, and letting go of the goals that I can benefit the most from this revitalizing and harmonizing practice. “We access the qi,” says Chen Fu Yin, “so that we can allow for the emergence of the shen or spirit”. In this way qigong becomes a deeply spiritual practice. The benefits of better health, more vitality, clearer emotions, and stronger immune system are all doors into the great realm of the spirit, where true healing lies. This extremely simple yet very powerful qigong practice sustains me, opens me to new experiences, and harmonizes my being. It has made me intensely grateful to be alive and to be a part of this great unfolding dance of Tao that swirls all around and within me. Check back about our upcoming private qigong classes thru skype! If you would like to put together a weekend training in your area give Solala a call at 541.345.8854 or write to solala@abodetao or The Empty Vessel, 1991 Garfield St Eugene, OR 97405. Sponsors get free workshop plus a percentage of the fees!